David Jaggs performs his own arrangements of film themes, show tunes, popular ballads and classical arrangements. David attended the Guildhall School of Music and Drama in London under the direction of Antonio Albanes. His classical career has taken him to many major venues up and down the country both as a soloist and in ensemble work. 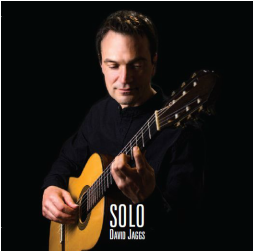 His recitals have been broadcast by the BBC and he has produced two albums, "Spanish Guitar Encores" and "Recital". In recent years David has applied his classical technique to interpreting a more popular repertoire with great success. His unique style has built a considerable following and "Solo" is his tenth album.